We spent part of today walking from one county to the other, along the road connecting Waltham Cross to Waltham Abbey. I hadn't been there since I was under ten and so didn't remember it at all. We had gone to view the Witchcraft exhibit at the Epping Forest Museum but the real star was actually the parish church. It started life as a Norman church, had a Tudor Abbey built on it's arse before that was demolished by the Plantagenets. Then the Victorians got hold of the blank back wall and let Burne-Jones loose on it. Good move. Whilst we were having a quick nose around inside, the Verger came up and gave us the entire history of the place. 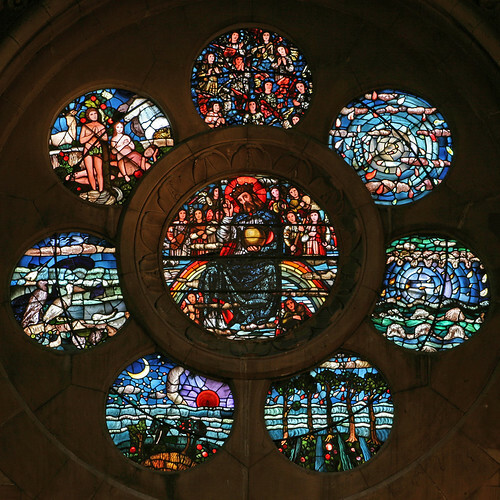 Here's the rose window showing the days of the week. The whole place is brilliant. There's a zodiac on the celing, another three windows showing the Bible from Creation to Jesus and a reredos with the story of Xmas. I couldn't recommend it enough. Have you ever been to Watts Chapel, Compton? I have heard of it but not seen. It's not too far from here so I could visit it. I also forgot to add that there's also a medieval frieze in Waltham Abbey of the judgement of souls at the end of time. It started life as a Norman church, had a Tudor Abbey built on it's arse before that was demolished by the Plantagenets. Curse those Plantagenet time-traveling vandals! Oops, wrote them the wrong way round. That's a great stained glass window! Did you take the photo? Mine never seem to come out! Not mine unfortunately, they're from Flikr. Mr Unwin, the verger, was excellent. We got over 1000 years in ten minutes flat. He certainly knows his stuff. A friend from circle dance went to the same church some years ago. She was also approached by some official, but that was to ask her to leave, as they had a concert starting soon. We had a friendly one on our visit!